My car is in production! Is that how other orders have gone? 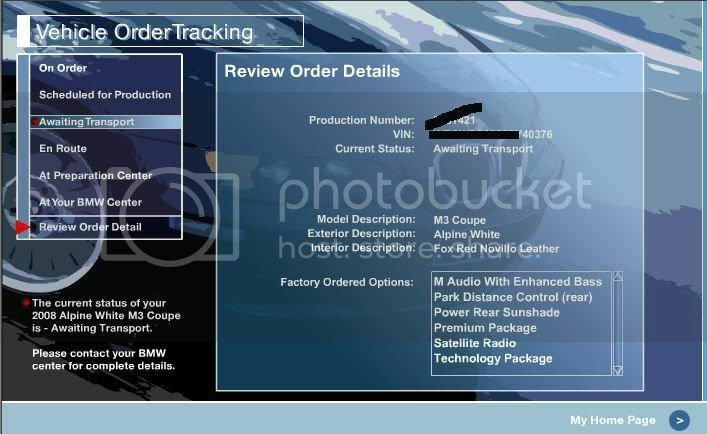 Were the other BMW's that people ordered delayed like that at the shipping origin? Does that happen before it goes to paint? Where are you in the process? I don't know. To get the details, you need to call your SA I think or talk to a rep. (I think I'm gonna stop calling them for the time being. Enough calls! ) OC got updated with the VIN 3 days after the car went into production. Also, the voicesystem is now saying "your car is in production with an estimated completion date of March 3rd". yep, it gets the VIN at the body shop before paint. Mark, urs is produced already? ^ yeah, it's at the port. Mine is a few days behind schedule. It was supposed to be done today, but BMWNA told me it is in assembly, which is stat 153. Last edited by nechronics; 03-03-2008 at 01:55 PM. Nice. It looks like you'll jump ship before I do! Congrats!!! How many days did it take you to complete production? Hey L.....found out today that mine is complete and waiting to be taken to the port for the voyage across the pond. Nice. I'm hoping mine will be completed by the time I call tomorrow morning. ^ sounds like a good reason to stay up all night. It has been built and sent to bimmerheaven!